Reader Favorite: The BEST Fresh Strawberry Pie EVER! *Every year when Strawberry season is upon us, I pull this one out of the archives. And, each year, more and more of you make it for the first time and it becomes a favorite in your house, too. 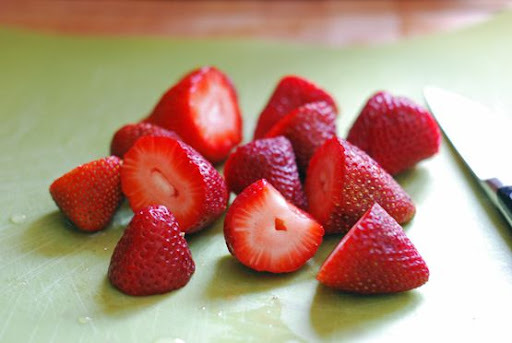 If you've picked fresh strawberries, which we did last week, you simply MUST put some aside and make this recipe! It's one of the most popular recipes on this blog and for good reason: It's just an absolutely delicious pie! Like crazy good. Or as my friend Emily would say, Cry-for-your-Momma good. Make this one, friends. You'll love it! It's strawberry season down here in the South, and if they're not ready in your neck of the woods yet, in just a few weeks, strawberries will be ready for the picking all over the country. 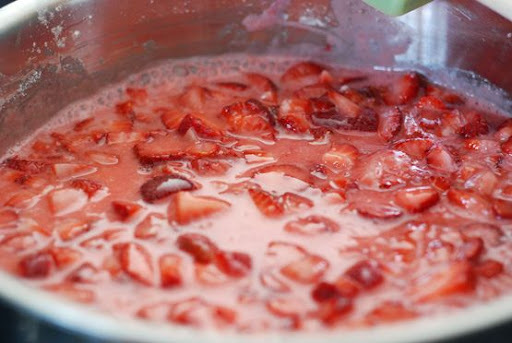 So, today, I'm reposting my ALL-TIME favorite strawberry recipe. This is my sister's recipe for Strawberry Pie, and it is THE BEST strawberry pie I have ever tasted. It's fresh and delicious and it will make you weep. It's that good. The BEST thing about this recipe, besides the fact that it will knock the socks off of your taste buds, is that it's only five ingredients. So, it's easy. Easy, easy, easy. 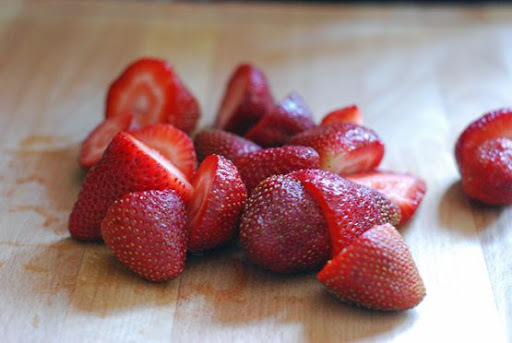 But, it also means that the strawberries get to take center stage - where they belong. Forever and ever. Since strawberries are a most stunning shade of red, and I love cooking and baking with my camera slung across my hip when pretty food is in the works, I brought him along while I made this beeeeeautiful pie last week. 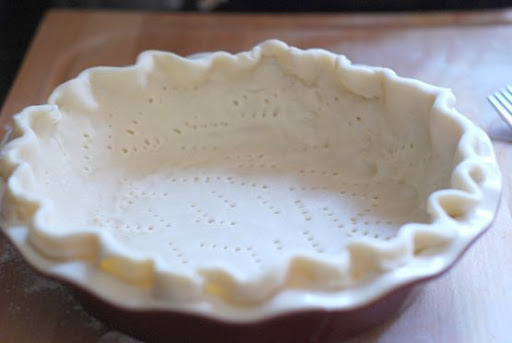 But, I also wanted to photograph and share the process with you because even if you have never made a pie before in your life, you can make this one - and I want to show you how truly easy it is! 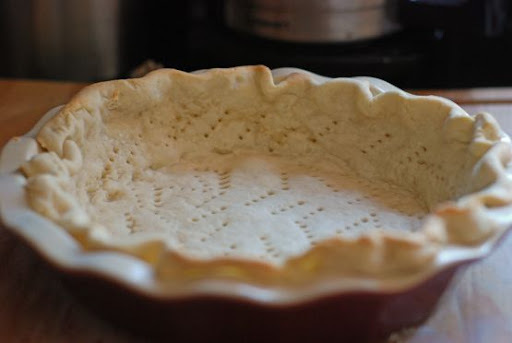 And, since I originally posted this recipe, I've also posted a tutorial on How to Make Perfect, Flaky Pie Crust. So, you can make this recipe completely from scratch - from start to finish. First, you need about two pounds of strawberries. Cut the green tops out of them (I think that's called hulling or somethin'), and place half of them on a cutting board/mat. 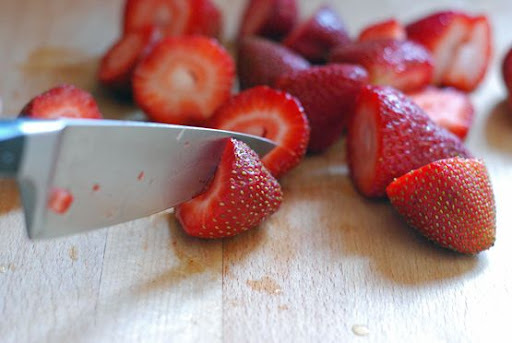 Thinly slice your beeeeautiful strawberries. 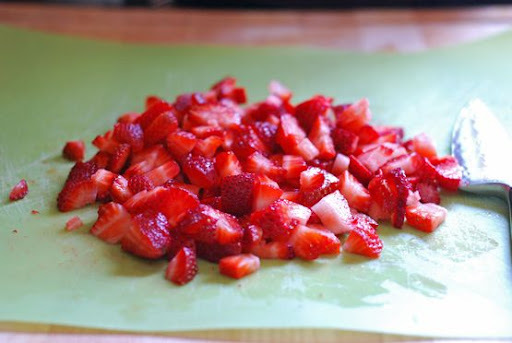 You then have a perfect pile of chopped strawberries. 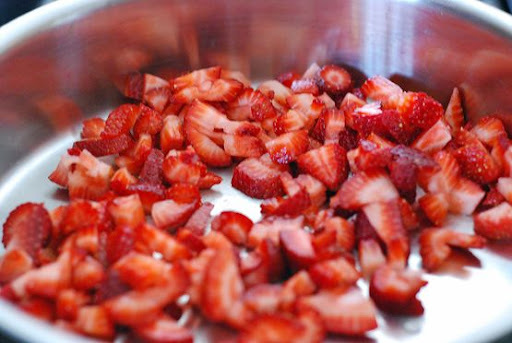 Place the chopped strawberries into a saute pan. Or pot. Or whatever suits your fancy. 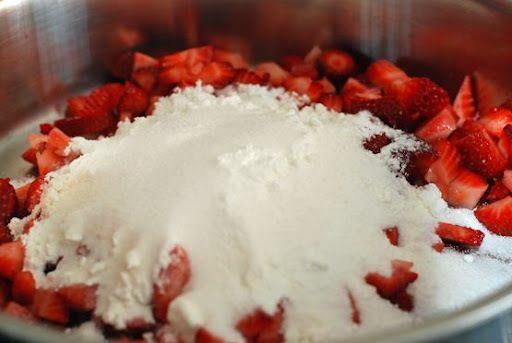 Cook strawberries and sugar/cornstarch on medium heat. 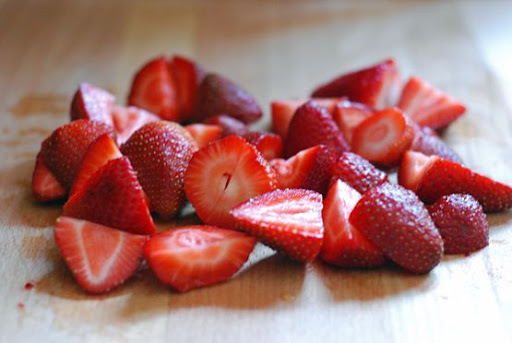 The strawberries will begin to break down. Or break dance. Somethin' like that. Meanwhile, take one of these beauties. 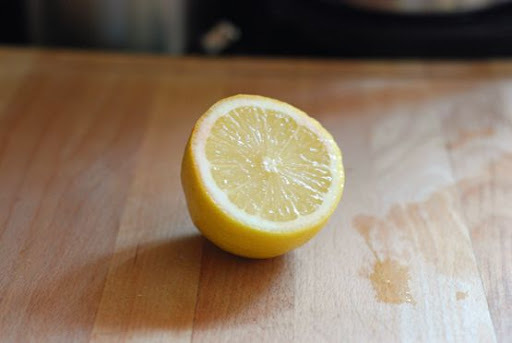 Cut it in half and add the juice of one half to the pan. Save the other half. You'll be wantin' to make this pie again tomorrow. Because there will be none left at the end of the day. 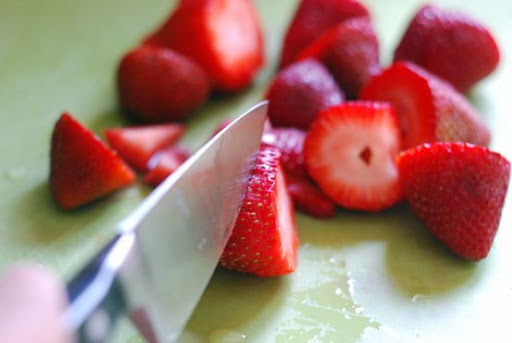 Using a whisk, crush strawberries as they soften and continue cooking on low heat for 10 minutes. Remove from heat. 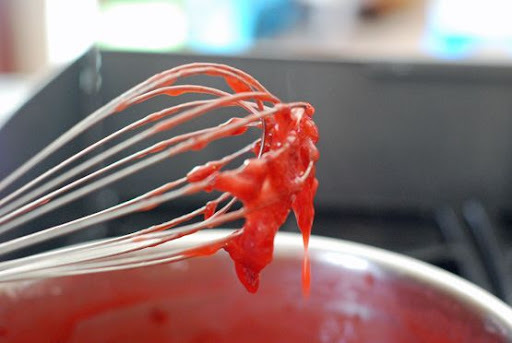 You want a glossy, thick sauce that will stick to your whisk a bit. If it all falls off, keep on a cookin'. This is what the finished sauce should do. Hang on to the whisk for a minute, then give up and join its friends. Now, you may stop here and call 'er a day. Because this sauce is perfect on everything from waffles to pancakes to french toast or dribbled over vanilla ice cream. So, pack it up if you want. 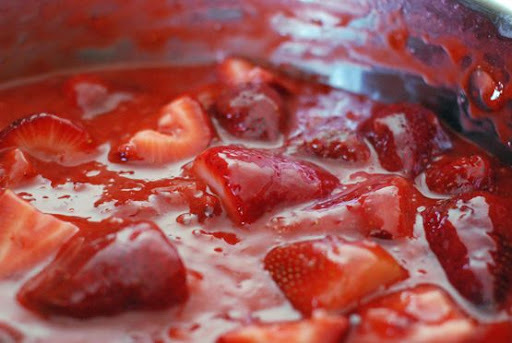 'Cause you've just made killer strawberry topping. But, I like pie crust as much as I like this sauce. I'm addicted to carbs. So, let's continue on. And, cut them in half. Only half. No chopping or cutting them smaller. 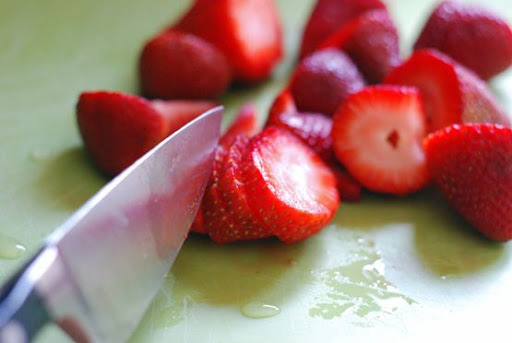 Unless you have the mother of all strawberries in your container, then you may cut it three times. BUT, step away from the knife. You want large pieces. You'll see why in a minute. I may have eaten a few of these. I may not have been able to help myself. 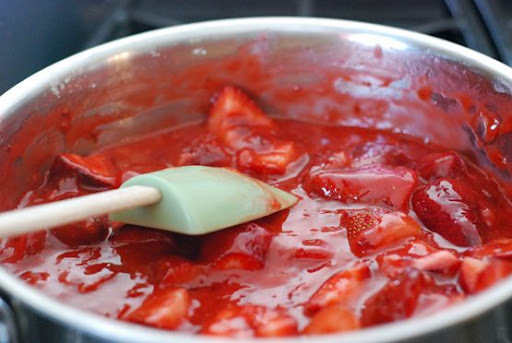 Add the halved (and ONLY halved) strawberries to the sauce. Combine with a spoonula thingy. Look! 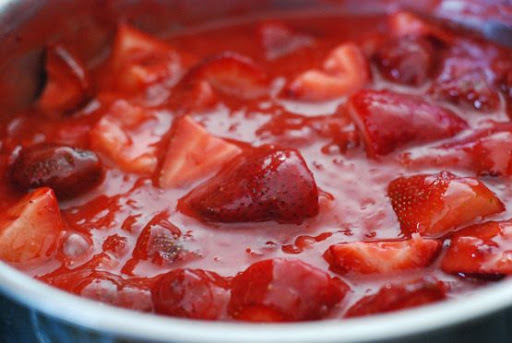 Just look at those strawberries swimmin' in that sauce. Drool. A few of these never made it to the pie. Grabbed a spoon and had a little tasting party. Once the sauce is finished, you take a pie crust and line a pie plate with it. (I make my own crust, but one from the frozen section of the grocery store works just dandy.) Flute the edges and prick it all over with a fork about 40 times. 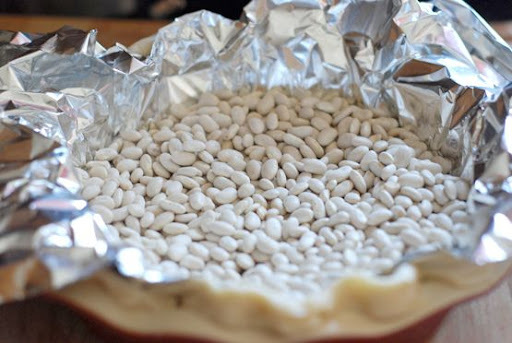 Then line the pie crust with foil, gently pressing it around the inside of the pie shell, and fill it with dried beans. Bake it for 10 minutes at 425 degrees. 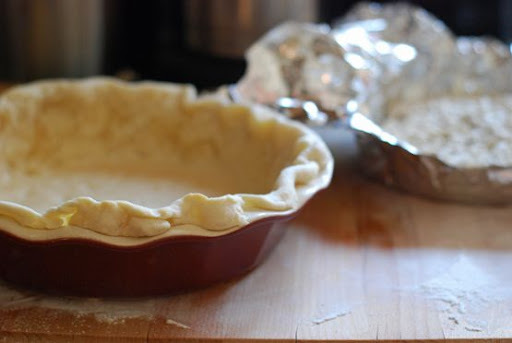 Remove pie crust from oven. The crust will be partially baked. No brown edges yet. Remove foil and beans, and bake for 5 more minutes. 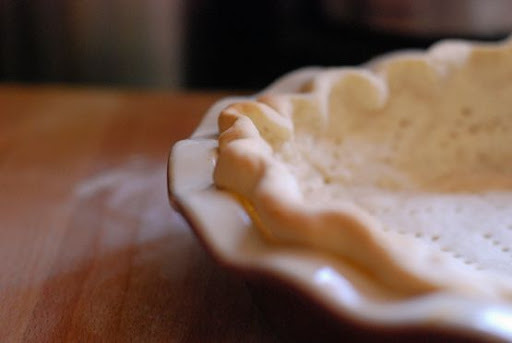 You end up with a perfectly baked pie crust. With perfectly golden brown edges. 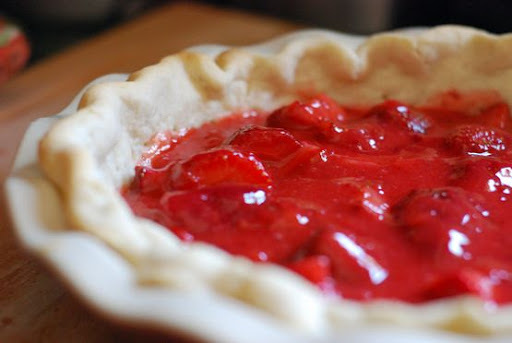 Pour the strawberry pie filling into your perfectly baked crust. If there's any left, that is. Chill your pie for about 2 hours. If you can wait that long. A beautiful, deeeeeelicous, fresh, easy strawberry pie. Isn't that color just amazing? Pure freshness, goodness, strawberry-ness. And, nothin' else in the pie tryin' to steal the show. Trust me. This pie will make you cry for your Momma. Wash strawberries and hull (removing the green tops and core). 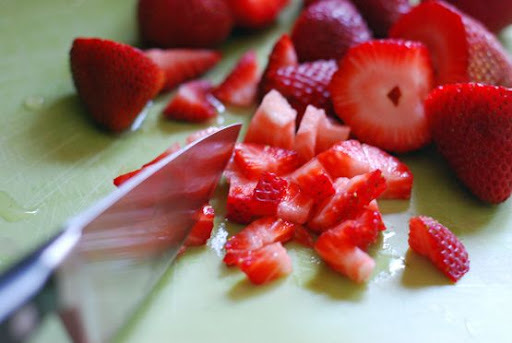 Chop 1/2 of the berries with into small pieces or process in food processor. 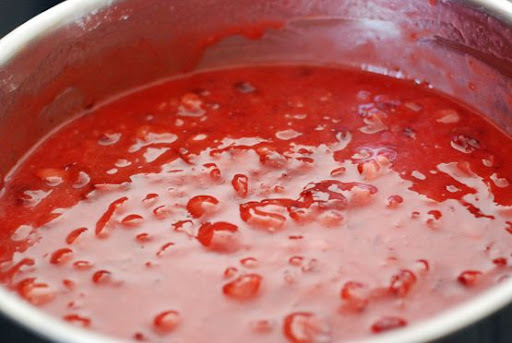 Place chopped berries into a sauce pan and begin to cook over medium heat. Mix sugar and cornstarch in a small bowl; add to pan with crushed berries. 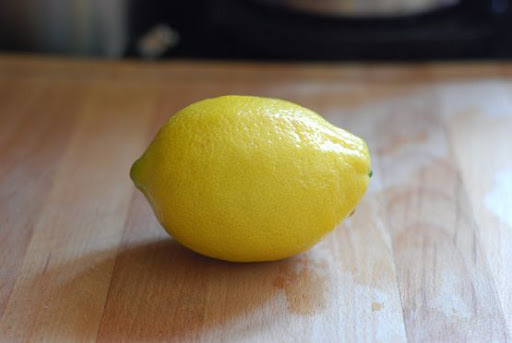 Add lemon juice and cook on low heat for about 10 minutes or until mixture thickens. Remove from heat. 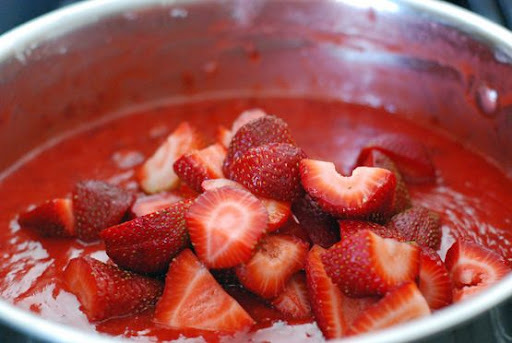 Cut remaining strawberries into halves and mix with the cooked mixture. Bake for 10 minutes. Remove from oven and remove beans and foil. Return to oven and bake for 5 minutes until edges are golden brown. 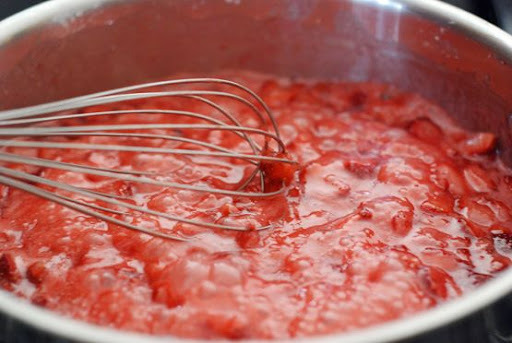 Pour strawberry mixture into baked pie shell. Chill in refrigerator for 2 hours, or until pie is set. Serve topped with whipped cream, if desired. Then slap your hubby, sister, friend, Momma, or mailman a high-five. Cause you've just made a killer Fresh Strawberry Pie! i made this last night and it was incredibly delish! mine did not hold firm though, is it supposed to? I wonder if i undercooked the saucepan portion. Stumbled across your blog while searching for a new recipe for the delicious strawberries we picked up at our local farmers market yesterday. The recipe is quick and easy and yet the result is fabulous!!! 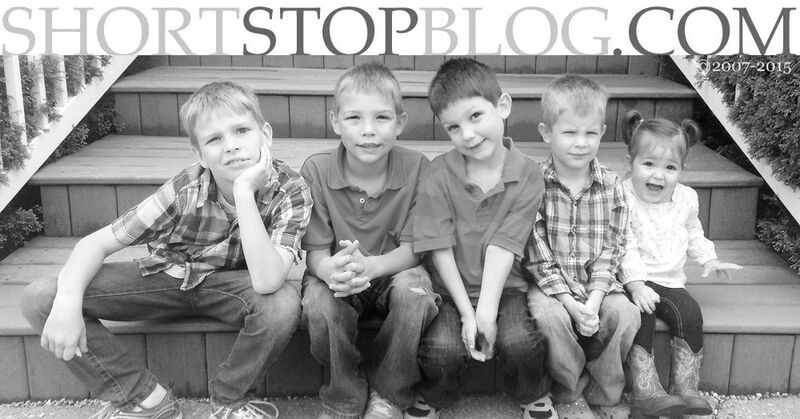 Thanks so much for sharing it, it is sure to become a family favorite for us too!